An education at its most exceptional is, first and foremost, built on relationships. It is my honor to lead The Pine School as we foster relationships with students and parents alike in order to create a meaningful and connected opportunity for learning. Our small size and careful attention to each family allows us to develop a unique path for each and every student we have the privilege to educate. Welcome to a community that promotes trust and teaches character as intentionally as core academics, students quickly find faculty and staff ready to support them as they explore a rigorous academic program and develop into young adults. Our students graduate with tremendous communication, quantitative and creative problem-solving skills. However, they also leave The Pine School with a connection to and empathy for the world beyond our campus. Committing to make the gift of an independent school education to your son or daughter is no small decision. I invite you to explore our website and reach out to arrange a visit. 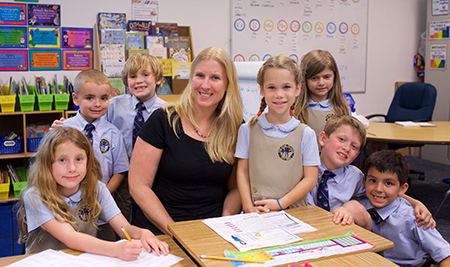 By coming to campus, you too will feel the familial warmth and love for learning that is part of what makes The Pine School the exceptional school it is. Binney Caffrey became The Pine School's 14th Head of School in July 2017. Ms. Caffrey comes to The Pine School from The Bishop’s School in La Jolla, CA where she worked for a combined 15 years, most recently as Dean of Studies - holding the Oliver Family Chair in Educational Leadership. She also held the positions of Director of Financial Aid and Dean of Student Life and began her career teaching mathematics and economics. Ms. Caffrey earned her Master of Arts in Economics from the University of California and holds her Bachelor of Arts in Mathematics from Williams College. This move is a return to the area as Ms. Caffrey was born in Stuart, FL and grew up in Fort Pierce. She currently resides in Hobe Sound with her husband Andrew and their two children JP & Nilla.